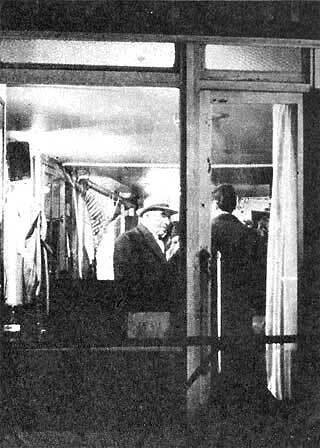 Georges Simenon was a regular at the cafés of the place Dauphine. And his pipe and his hat make him look a lot like Maigret, who also came often to Les Trois Marches for lunch. When he was particularly preoccupied with an investigation, everyone could tell by the way he came in, "his heavy step, fixed gaze and apparent bad mood made it apparent that sometime soon, a man or woman was going to confess..."
Quai des Orfèvres, eight o'clock in the evening. It snowed last night, and on the banks of the Seine you can still see patches of white contrasting with the dark and immobile masses of barges moored for the night. Further off, by the place Saint-Michel, you sense the incessant movement of a noisy crowd beneath the broad patch of light, suggesting that over there the pulse of life beats very quickly. Here, all is different. It would seem that the simple fact of crossing the bridge is all it takes to change the accelerated rhythm of the other bank into a mysterious and slightly frightening calm. The rare passersby slip quickly past the massive buildings of the Palais du Justice. But one of these lone walkers seems to linger in the vicinity... Unassuming overcoat, soft hat, pipe stuck stubbornly in the corner of his lips, he strolls easily, hands in his pockets, toward the entry of the Judicial Police. He touches his hat with a finger when passing before the sentries, and enters without hesitation this edifice which so many have gone into with handcuffs on their wrists. He follows passageways, climbs stairs, and passes offices to arrive finally before a door on which is inscribed "Chief Inspector Clot, Judicial Police". Our man enters and heads to the imposing armchair that waits behind a desk. He sits down comfortably, with a sigh of satisfaction, and we discover his face and identity  it is Simenon, the father of Maigret. For twenty-five years, Simenon has dreamt of playing this character that he created, that his millions of readers know so well. Today, it is no longer just a dream, thanks to television, which undertook to confront fiction with reality, to compare Maigret and Chief Inspector Clot, chief of "Homocide," and to see if the locale of the P.J. looks like Simenon's description  In search of Maigret, direct from the P.J., Sunday, February 2, at 9:55 pm. "I took all my models from right here. I watched them at work, and I picked up their habits. Maigret is a little of Chief Inspector Massu, a little of Chief Inspector Guillaume, who worked here for years. For months, I haunted the Palais du Justice, the place Dauphine, the little corner cafés. 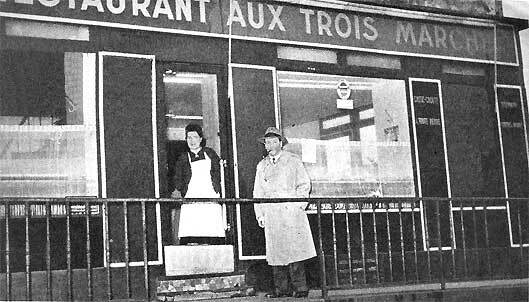 In fact it was at the counter of "Les Trois Marches" that I met Massu for the first time..."
Behind the window, in a soft hat, we see Chief Inspector Massu. "In this work you shouldn't seem too smart... "
"It's often said that you were a model for Simenon's famous character, Chief Inspector. When did you first meet? "It must be about twenty-five years ago. 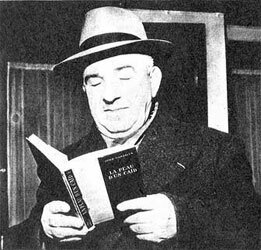 The Director of the Judicial Police had advised him to come and see me for information about the way we worked, the way we lived..."
Chief Inspector Massu is a model Simenon used to create Maigret. Massu isn't actually a regular reader of detective novels... contrary to what this photo suggests. We will finish our tour back in the office of Chief Inspector Clot. Will we know then who the true Maigret is? Georges Simenon will give us his own opinion. "Maigret is a modern man, but one who has also lived in other times. He is now fifty, a mixture of Gabin, Renoir, Préjean... all the actors who have brought him to life on the screen." Massu with the producer. The torment of spotlights over, the policeman recovers his old habits quickly, playing 421 with producer Jean-Marie Coldefy. "In search of Maigret" will reveal to viewers the real milieu in which the hero of Simenon's novels was supposed to have worked for close to thirty years. But the movies could only attempt to reconstruct the atmosphere of these areas of the P. J. where the Chief Inspector conducted his cross-examinations. And we've always been less concerned with this fabricated atmosphere than the image of Maigret that was presented to us. It was in 1932 that Julian Duvivier gave the screen the first portrayal of this character whose features, habits and methods of work have been so clearly fixed by his author since the publication of Pietr le Letton and Monsieur Gallet, décédé. 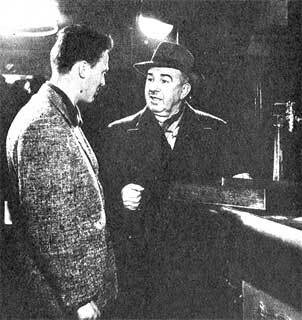 In his adaptation of La Tête d'un homme, Duvivier selected Harry Baur for the portrayal of Maigret. 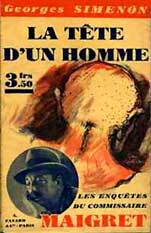 This actor's depiction seemed so true that, for some time, the photo of Harry Baur as Maigret decorated the covers of new editions of the adventures of Simenon's hero. However, in spite of his immense talent Baur still exaggerated somewhat, by tricks of excessive expression, the tics and mannerisms of his character. His theatrical anger contrasted dangerously with the restrained placidity of the policeman. The following year, Jean Renoir gave us La Nuit du carrefour, entrusting his brother Pierre with the role of Maigret. While physically this actor could have represented his character believably, psychologically he clashed. Pierre Renoir, in spite of the pipe, the mustache and an artificial untidiness, gave, by his silences full of insinuation and his reflective pauses  characteristic of his acting  an erroneous aspect of a subtly deductive Maigret. 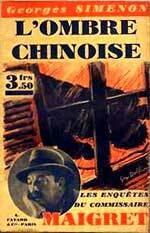 More or less around the same time, Abel Tarride took on the persona of the Chief Inspector while solving the mystery of Le chien jaune. In the picturesque decor of Concarneau and the battlements of its enclosed town a third Maigret came to give to the public a distorted reflection of the character. An excellent actor, Abel Tarride still had difficulty in making us believe that this well-bred policeman who seemed to smoke his pipe reluctantly, was the same one as the impenitent beer drinker who liked to lounge on café terraces, his packet of grey tobacco resting on a sticky table! The years passed and we had to wait until the occupation for Maigret's return, in the guise of an interpreter with features at the very least unexpected, Albert Préjean, in Signé Picpus, Cécile est morte and Les Caves du "Majestic". An astonishing Maigret, rejuvenated, slender, elegant, dynamic, wearing a felt hat pulled down jauntily on his forehead and smoking a short-stemmed pipe. In contrast to this new-look model, we have, some years later, that of the massive Charles Laughton, with his twitches and winks. Of this American remake of La tê d'un homme made in Paris and entitled L'Homme de la tour Eiffel, the less said the better. Infinitely more orthodox was the composition of Michel Simon in the film Brelan de l'as, in which this remarkable actor interpreted a sketch inspired by the short story, Le Témoignage de l'Enfant de choeur. Finally, more recently, in Stany Cordier's Maigret dirige l'enquête, we saw Peter Manson give Simenon's hero an image, incontestably original, but more suitable to a stolid and elegant bloodhound of a Scotland Yard policeman than to a civil servant of the quai des Orfèvres. Today, Jean Gabin, in Maigret tend un piège, succeeds in his attempt to persuade us that he is himself Maigret. This is no longer Gabin playing Maigret, but actually Maigret reincarnated in Gabin. This passionate demonstration is finally extremely conclusive. The taciturn Chief Inspector that he personifies, grumbling, suddenly violent, but understanding and human, is well and finally the Jules Maigret who, if he continued to exercise his functions in 1958, would inevitably have given up his bowler, ankle boots and velvet-collared overcoat. MAIGRET was born of a childhood memory. Simenon, when he was eight, went swimming in the Meuse with M. de Saint-Hubert, a retired police Chief Inspector who recalled his career happily. Thereafter, Simenon studied criminology and was judicial columnist on the Gazette de Liège. This was how he got the idea, around 1928, to give up writing the pulp novels (signed Georges Sim), that had brought him success, and to dedicate himself to semi-detective books where the atmosphere and portrayal of characters would have more importance than the criminal intrigue. He chose for the hero of these new adventures the character of a Chief Inspector of the P.J. named Jules Maigret, who had held an accessory role in one of his earlier novels, Matricule 12. 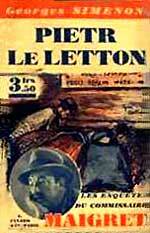 Pietr-le-Letton and M. Gallet, décédé  the first two books of this new series  were published in 1930 and, for several years, Simenon wrote and published, every month, a new Maigret adventure. The advertising campaign for the launching of the first two Maigrets constituted a major Parisian event. Simenon had the idea of using radio, news, and especially of giving a "Grand Anthropometric Ball", whose invitations included the mark of a fingerprint. After that, outdone by the character he had created, Simenon published Maigret's Memoirs, in which his hero describes the author, somewhat mischievously, and notably reproaches him for always having him dressed so poorly. 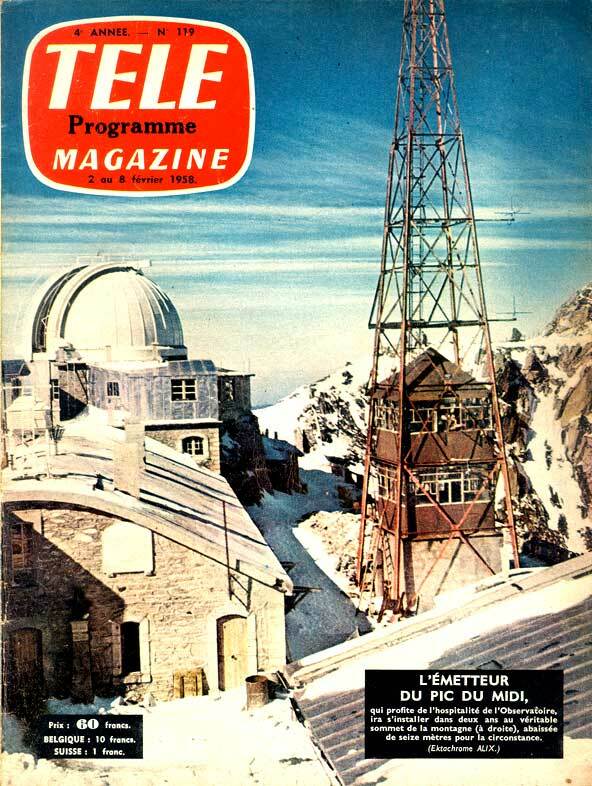 A broadcast by Jean-Marie COLDEFY. No camera of the movies or television, nor radio microphone, has ever been allowed to penetrate the Judicial Police to do a documentary. It will therefore be a major first when Jean-Marie Coldefy has us follow Georges Simenon into these offices whose address is known throughout the world: 36, Quai des Orfèvres. For 50 minutes, this great writer will endeavor to show us the true face of the P.J. while confronting the heroes and settings from which his works and films have been drawn, and the reality that the civil servants of the Judicial Police will have us discover. Thus will be portrayed the face of the policeman of 1958, who has neither the genius of Sherlock Holmes, nor the infallible reflexes of Lemmy Caution, but rather a faculty of intuition and adaptation to his surroundings, the common sense of the average Frenchman, the professional conscience of a craftsman and the silhouette of Everyman... A portrait that, all in all, looks enough like that of Chief Inspector Maigret.